This type of preparation profits from the additional step of velveting the meat. In this version, instead of velveting, I opted to cook the chicken sous-vide, then slice it and incorporate in the sauce. It worked very well, in fact I’ve done that with beef also, but never blogged about it, not sure why. Those pictures are still sitting in a folder from 2016, if you can believe it… But back to what matters. This turned out so delicious, the husband made me promise it will be a regular in our rotation. Number one fear of a food blogger’s partner: once a recipe is tried, it will be gone forever! No such risk with this one. 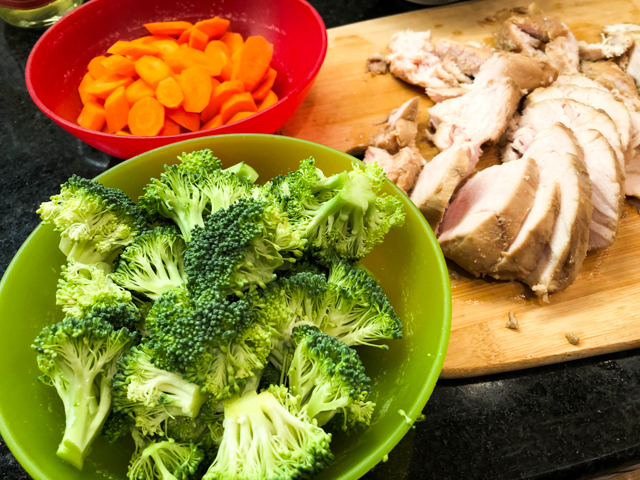 If you don’t have a sous-vide gadget, simply slice the chicken very thinly, use the velveting method I showed before (click here), and proceed with the recipe as described. Place the chicken breast rubbed with the olive oil and seasoned with ginger and salt inside a food-safe plastic bag. No need to seal with vacuum, but you can if you prefer. Place chicken in sous-vide at 150F and cook for 3 to 4 hours. Time is flexible, you can leave it longer if needed, but don’t let it go past 6 hours at that temperature. Whisk all ingredients for the sauce in a small bowl, and reserve. Heat the olive oil in a wok or large non-stick skillet (12 inch) over very high heat until almost smoking. Add the broccoli and carrots, season with salt and red pepper flakes, stir-fry for a couple of minutes. When the veggies start to get some browned spots, pour 1/3 cup water in the pan and cover with a lid. Cook for 2 to 3 minutes more, open the lid and check that the veggies are tender. If there is any liquid in the pan, let it evaporate. Add the chicken slices previously cooked, move the pieces around to warm them through. Add the reserved sauce, and simmer everything together until the sauce is slightly thickened. Squirt some lemon juice right before serving, and sprinkle with sesame seeds, if so desired. Comments: Funny little tangent. Probably because of all the baking I’ve been doing, I am now really adamant about mis-en-place. As I was preparing this meal, I had all my ingredients prepped, super proud of myself. I took the picture above and then proceeded to gather the ingredients for the sauce. Added everything to a nice yellow bowl, and had this self-complimenting thought “you are really dominating this mis-en-place thing.” Right after my neurons formulated the thought, I dropped the orange in the beautiful yellow bowl with all ingredients so carefully measured and ready to go. Bowl flipped on the counter top, spilling everything right before my adrenaline-dilated pupils. Lesson in humility taken. End of story. 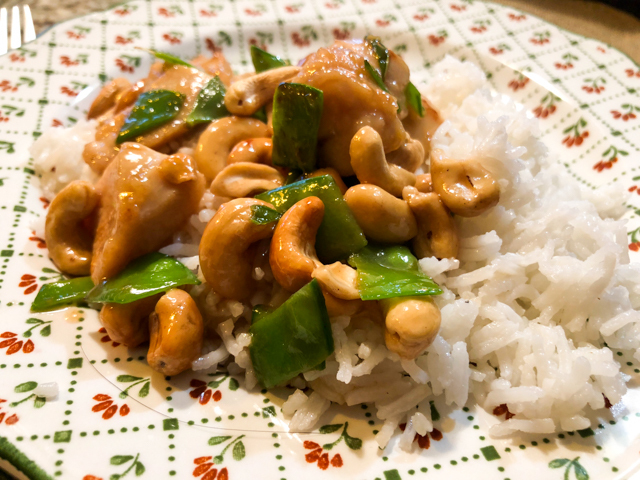 But, despite the drama, this was one tasty meal, reasonably low in carbs and fat, and the chicken had perfect texture, none of that stringy quality so common in stir-fries. The sous-vide is a nice option. You could conceivably make it the day before even, keep still in the bag in the fridge, bring to room temperature as you get your ingredients ready. We’ll definitely incorporate this recipe in our regular rotation from now on. Just need to work on that “mis-en-place” thing. Beware: I am taking a Chinese classic and messing with it. 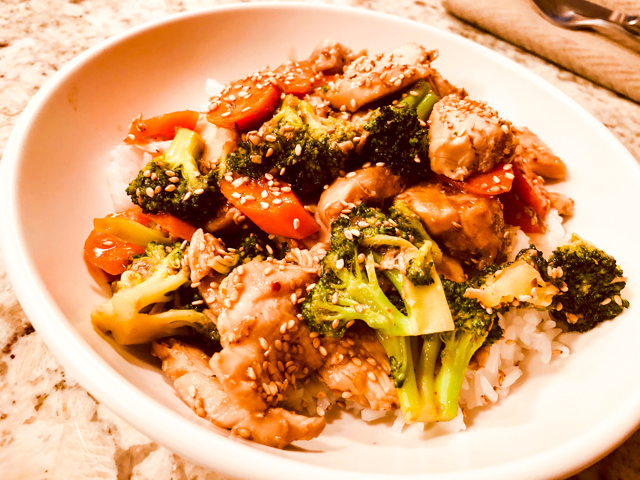 This turned out absolutely delicious, and so quick to put together like it’s the case for stir-fries. Gather all your stuff, turn the heat on, and be ready for dinner in 5 minutes. It did involve about 25 minutes prep ahead, mostly waiting time, which was perfect to cook some rice as a side dish. Efficiency. One of my favorite words. Particularly welcome on a weeknight in which my experiment was a big failure and last thing I needed was to face a complicated dinner preparation. Cut the chicken breasts into 1 inch pieces. Place in a bowl and add the baking soda, mixing to coat all pieces. Leave 15 minutes at room temperature. Rinse the baking soda out using a colander, then place the pieces of meat on kitchen paper to dry. Marinate the chicken pieces in rice wine and cornstarch for a few minutes. As the meat marinates, mix all ingredients for the sauce and set aside. Heat one tablespoon of oil in a wok until almost smoking. Add the chicken pieces and stir-fry until almost cooked through. Remove and reserve. Heat one more tablespoon of oil, add the grated ginger and the snow peas, stir fry for a few minutes. Add he chicken back to the wok, pour in the sauce and cook until the meat is fully cooked and coated with the sauce. Sprinkle toasted cashews, mix and warm up for a minute or so. Serve right away over steamed rice. Comments: What I love about this recipe is the simplified method of “velveting” the meat. Usually the process, very common in Oriental stir-fries, is a lot more involved. The pieces of meat are marinated in a mixture of egg white and cornstarch, then dropped in either simmering water or oil for a brief pre-cooking time. You can find a detailed explanation here. It results in amazing texture, but it is a bit involved, you are left not only with the wok to clean but the large pot used for the pre-cooking time. In this recipe, the meat is simply coated with baking soda, which increases the pH (or in other words, reduces acidity) and affects the way the molecules of protein at the surface of the meat interact with each other. 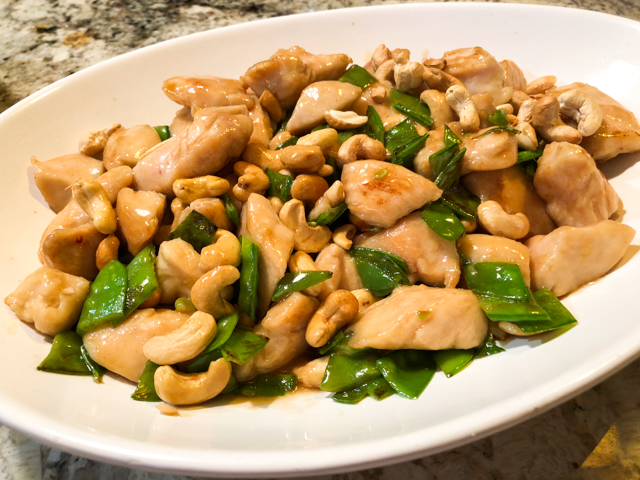 Instead of trying to stick together and resulting in that harsh texture so common in quick stir-fry dishes, they behave with a lot more composure, and interact with the sauce components more efficiently instead. The texture changes so much that it does give the impression of velvet. Try it, and you will be hooked, I guarantee. You can use the exact same approach with other types of protein, seafood, beef, pork. Just add the baking soda, allow it to sit for 15 minutes, rinse it out, dry the meat and proceed with your recipe. This is by far my favorite type of lunch. 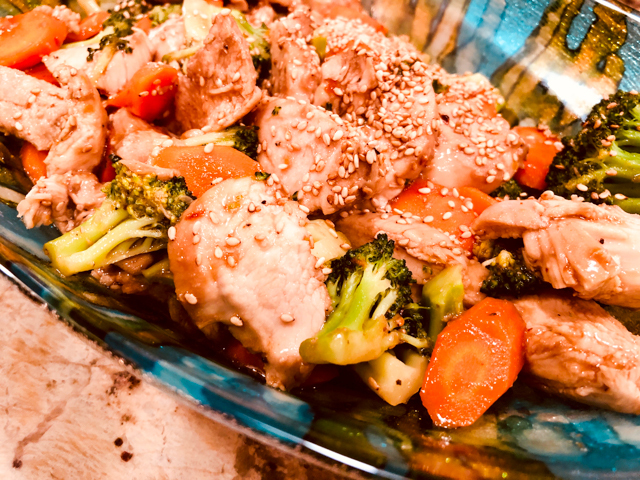 A lot of protein in a flavorful, spicy preparation, with some veggies to make things more interesting. 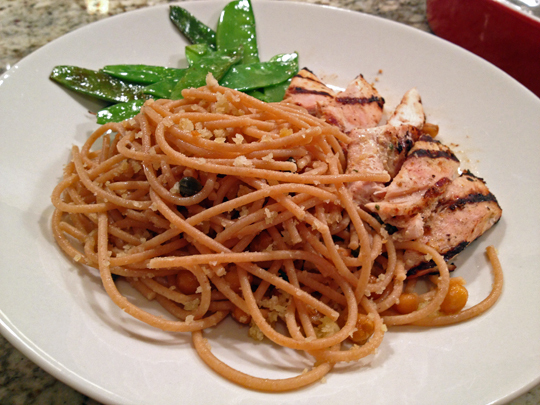 The inspiration came from this post by Lydia, hostess of The Perfect Pantry. 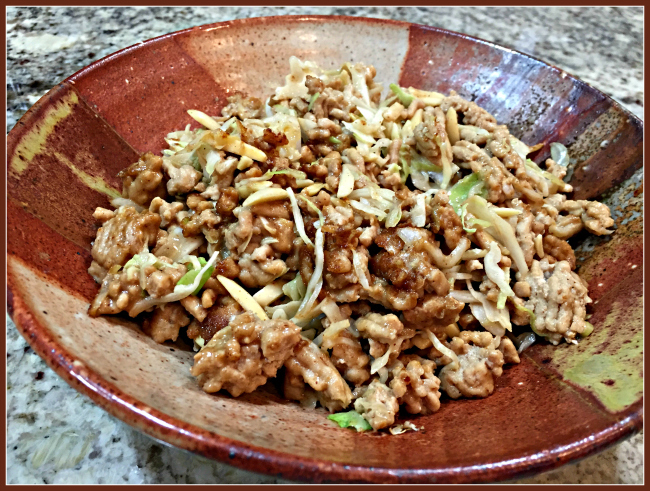 I substituted ground chicken for beef, almonds for peanuts, but the basic idea was unchanged. Of course you can take this simple method in countless directions, adding green beans, sautéed corn kernels if you’d like a bit more carbs, sautéed spinach, chickpeas, use cashew butter, sprinkle toasted cashews at the end. I adore this type of recipe! In a glass measuring cup or small bowl, beat together the almond butter, coconut aminos, agave, rice vinegar and Sriracha until the mixture is smooth. If too thick, loosen it a bit with water. In a large skillet or wok, heat the coconut oil (or another fat of your choice), then saute the shallots until translucent, add the ground chicken and cook until golden. Season lightly with salt and pepper. Pour in the almond butter mixture, and stir to combine with the meat. Add the shredded cabbage and slivered almonds, and cook for 30 seconds or until the cabbage wilts slightly, but does not soften completely. Serve with additional Sriracha sauce. Comments: Stir-fries using ground meat are not eye-candy, I admit it. But this concoction is so flavorful, I hope you’ll overcome its looks and give it a try. The picture above was from my third day in a row enjoying it for lunch with leftover roasted butternut squash. Instead of more Sriracha sauce I drizzled Gochujang all over it. Wonderful things happen when Sriracha meets Gochujang. Clearly, it’s a Batman and Robin thing. ONE YEAR AGO: Fifteen Years! One of the cuts of meat that is always present in our weekly rotation is pork tenderloin, because it cooks fast and goes well with many types of seasonings. For that reason, I am always searching for new ways to prepare it. I found this recipe through a Google search, decided to give it a try without any intention of blogging about it. Sometimes it’s nice to simply cook and eat dinner like normal people do. You know, without the need to scream at your partner “DO NOT DARE TOUCHING IT, I HAVE TO TAKE A PICTURE!”. It does get old after a while. So, I sliced the meat, served it, and Phil, very surprised asked me “You won’t be blogging about this?”. No, I’ll let this one slide by. Then, he took a first bite, and told me “Sally, this has got to be in the blog, it’s very good!”. 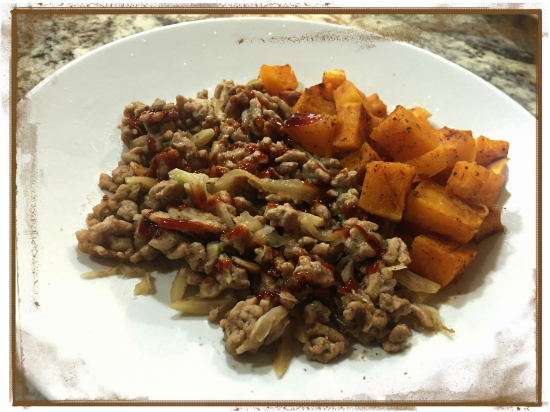 I had to agree, it turned out super tasty, and deserves to be shared with my readers. A picture was quickly snapped, and we moved on with our dinner. In a small saucepan, heat the oil over medium heat. Add the garlic and saute until fragrant and golden, about 1 minute. Stir in the chile powder, vinegar, oregano, sugar, salt, and water. Simmer over medium-low heat, stirring occasionally, for 5-10 minutes until flavors are combined. Let cool to room temperature (or, if making ahead, refrigerate). Set aside about 1/4 of the marinade. 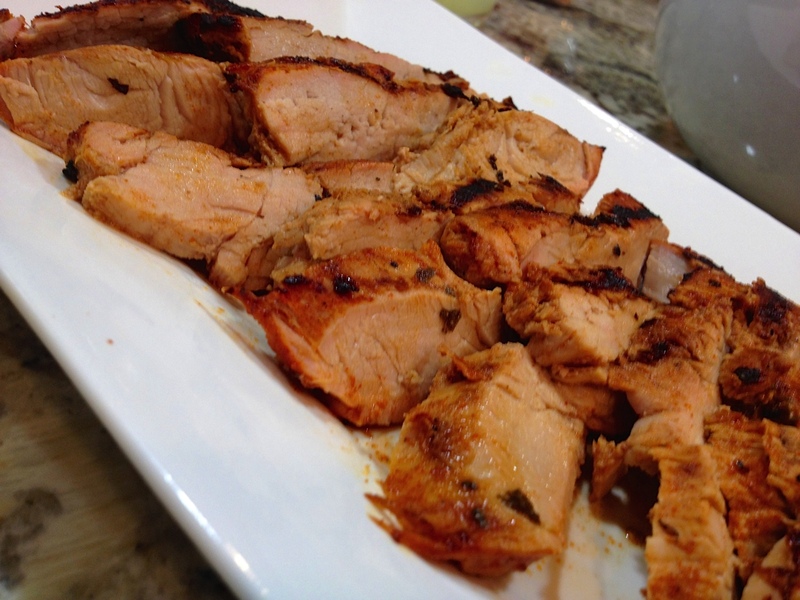 Place the remaining marinade and the pork tenderloin in a shallow bowl or resealable bag, making sure to coat the pork with the marinade. Marinate for several hours or overnight. Sprinkle a little extra salt on the tenderloin. Grill to your desired degree of doneness, brushing with the reserved marinade half way through cooking. Allow to rest for 5-10 minutes before slicing. Comments: If you want to learn more about the concept of “carne adobada” in Mexican cooking, Wikipedia is waiting for you with a click here. This preparation ends up with a subtle heat, and the acidity of the vinegar brightens up the flavors. 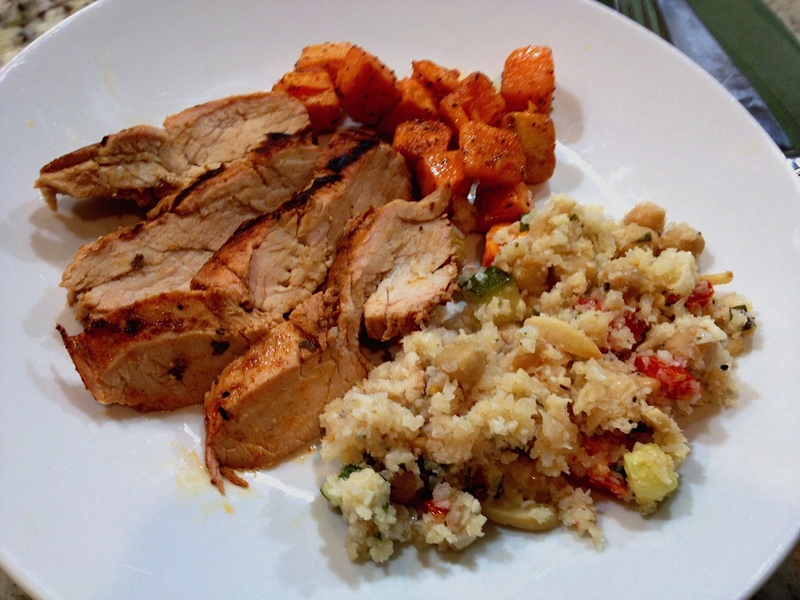 Very nice take on pork tenderloin, which should work equally well on boneless chicken breasts. You can cook the pork on a cast iron pan and finish it in the oven, or use any type of preparation you are comfortable with. I always butterfly it to speed up cooking, but the original recipe did not call for it. As I mentioned many times, we grill 12 months of the year. Phil grew up in Michigan and a little snow (less than 3 feet, that is) doesn’t scare him. Me? I inform that we will be grilling, which means “Darling, you light the grill, monitor the cooking, and bring it all back to the warmth of our home once it’s done”. Sometimes I amaze myself at my efficiency. In five years of blogging, I probably mentioned this before once or twice: I am not too wild about cooking fads, and usually avoid them. For instance, that one from years ago, foams. You could not go to a restaurant that considered itself slightly upscale without foams bubbling around your plate. Then we have the more recent bacon-mania. Because 90% of humans adore bacon, all of a sudden bacon started popping up in every single culinary item. Chocolate-covered bacon? Yes, it is out there! Bacon ice cream? Why not? Well, if I have to explain it, I guess we are from different planets. And let’s not get me started on the fried egg topping everything lately. I guess this fad is still in its exponentially growing phase. Having said all that, I am heavily into the spiral cutter thing. And I insist, this is not a fad. It is a nice way to treat vegetables, easy to use, fast to prepare, and a ton of fun to eat. Zucchini is by far my favorite target, and I’ve shared one of the ways we enjoy it almost weekly, uncooked, bright and fresh. Strands of zucchini can get mushy very quickly when cooked, but now I think I hit the perfect method to deal with them. Cook the pasta in plenty of salted boiling water. As the pasta cooks, heat the olive oil, saute the shallot and red bell pepper until the shallots are translucent and with a little bit of color, and the red bell pepper starts to soften. Season lightly with salt, add the zest of the lemon on top of the warm mixture, cover the pan and let it rest while you finish dealing with the pasta. Ten seconds before the end of cooking time, add the zucchini strands to the pot. Time ten seconds and immediately drain it, reserving a little of the cooking water. Return it to the hot, empty pot, add the sautéed shallots and red bell pepper, squeeze a little lemon juice, toss it all gently, and adjust with pasta cooking water if necessary. Taste for seasoning, adding ground black pepper if you like. One of the things I love about this type of recipe is that you can vary the amount of pasta in it according to your mood or goals. In the recipe I shared today, zucchini was prominent, pasta played a secondary role. The resulting meal felt light and bright. A few weeks ago, I went the opposite way, and made the zucchini stay in the background. 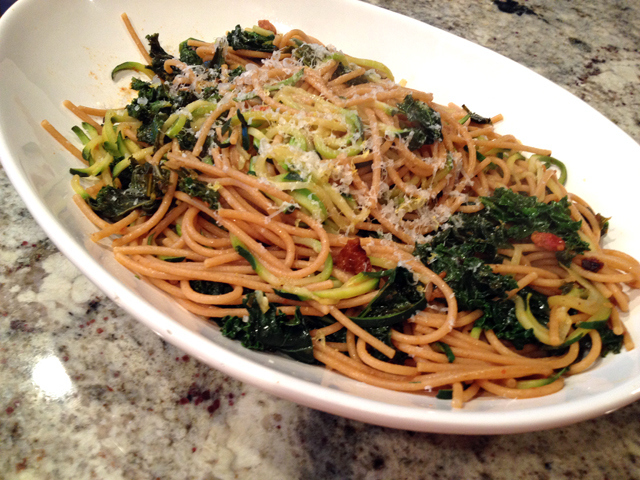 At that time I added wilted kale and sun-dried tomatoes to the dish. It was slightly heavier, and quite appropriate for the sorry evenings ahead, when the temperature will fall below 90 F, and I will go through a few boxes of Kleenex to deal with it. If you are over the fence about getting a spiralizer, jump to the right side, the side where I am ready to play with you. You will not regret it, especially if you have kids who are over the fence about eating their veggies. 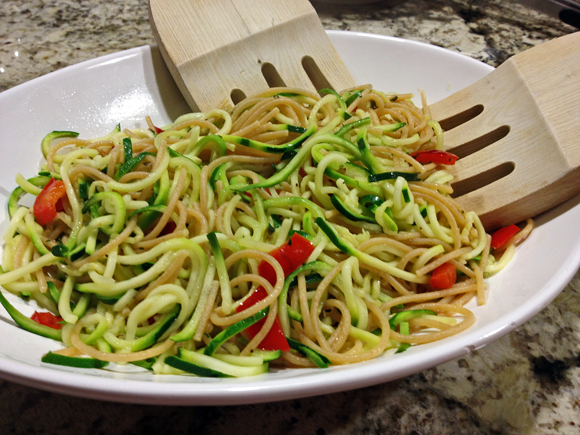 They might profess zoodles – like this tasty version from Mike’s blog – their favorite dish ever! For most people, there is such thing as a grilling season, and it’s starting right about now. For us, the grill is going all year-long, no matter the temperature outside. We never stop. Of course, it is a lot nicer to be out moving stuff around the grill wearing shorts and a t-shirt instead of a down jacket. Let me rephrase that: it’s a lot nicer to do anything wearing shorts and a t-shirt. This is the perfect recipe for those busy days. Boneless chicken thighs stay the whole day in the fridge, marinating in coconut milk, tamarind, and a few selected spices. When you get home, bring the chicken to room temperature as you heat your grill and get your side dishes going. The meat will be moist, tender, with the right amount of heat. You will love this! 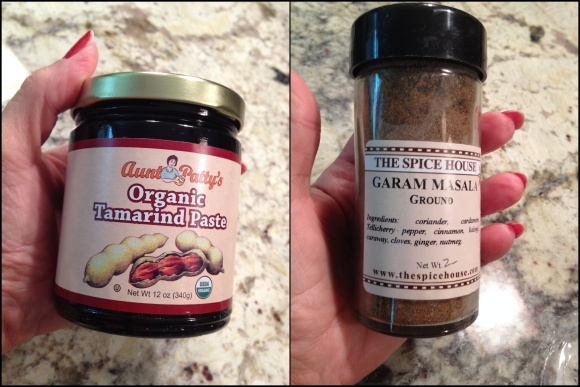 In a large bowl, combine coconut milk, tamarind paste, garlic, salt, garam masala and cayenne. Add chicken and turn to coat well with marinade. Cover and refrigerate for 4 to 8 hours. 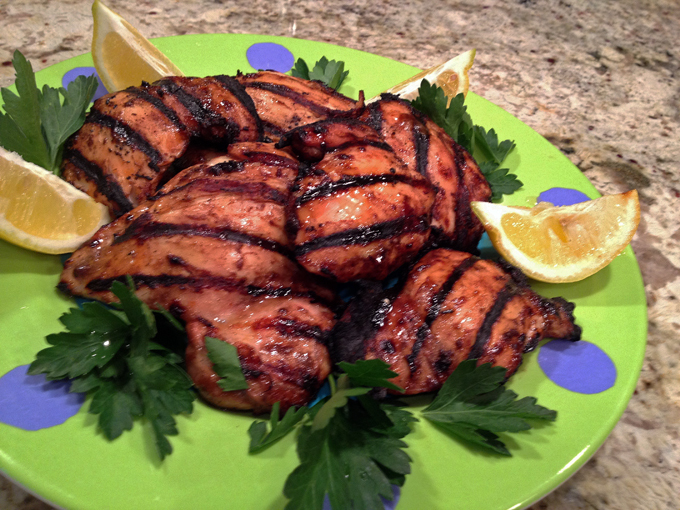 Remove chicken from marinade, and grill for 8 to 10 minutes per side. You could also brown chicken in a skillet on stove, place on a baking sheet and finish cooking in a 375 degree oven for 20 minutes. Garnish with lemon wedges and cilantro. Absolutely delicious and a cinch to put together, I dare say that even chickpea haters might appreciate these little creatures when presented this way. This was my first time roasting capers, but it won’t be the last. Great boost of flavor for an ingredient that already has quite a strong personality. 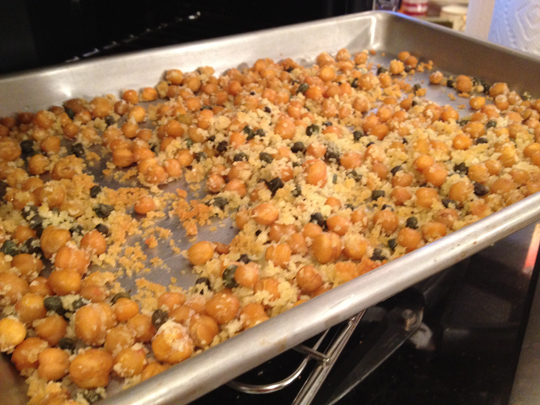 Heat oven to 400° F. Combine the chickpeas, panko, capers, oil, coriander, and ½ teaspoon each salt and pepper on a rimmed baking sheet. Roast, tossing once, until crispy, 18 to 22 minutes. 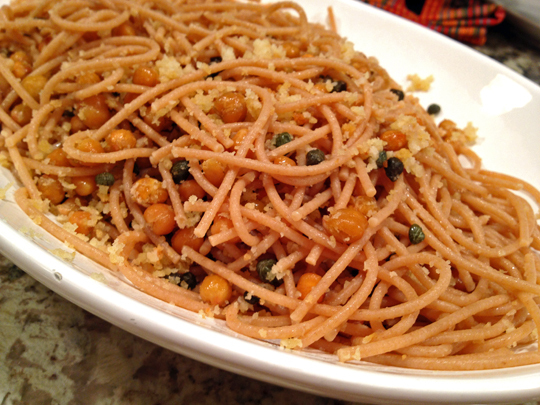 While the chickpeas are roasting, cook the pasta in plenty of salted boiling water. Once the pasta is cooked, drain it and return it to the pan. Add the chickpeas, cilantro, and lemon juice to the pasta and toss to combine. Comments: What a great, simple recipe this was! I’ve roasted chickpeas before, but they always turned a little mushy. The addition of panko-style bread crumbs brought a very pleasant crunch to the mixture. Roasted capers were another very pleasant surprise. I love their sharp, pungent taste in any type of recipe. Roasting changes that sharpness quite a bit, I would say it takes some of it away, but at the same time intensifies the pure caper flavor. Am I making sense? 😉 Make this pasta and see what you think.